Finally, a CD version (with 3 bonus tracks recorded live during one of the duo's UK appearances) of what was originally a cassette-only release on the seminal ROIR ("ReachOut International Recordings") tape label, of recordings by the seminal New York City band (complete with Lester Bangs' original essay relating their music to the same elements of NYC that produced the VU and New York Dolls). 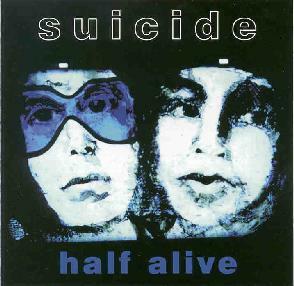 Suicide were undoubtedly far ahead of their time, both in the relentless minimalism of their music, and the extreme affront of its delivery. They were probably also the first vocalist/keyboard duo, although that's not necessarily an innovation to brag about! Unlike the synth-pop drabble that later followed that band configuration (once things like MIDI and digital synthesizers made it easy), Martin Rev employed his keyboards' (more organ than synthesizer) and early rhythm machines' propensity for noise and numbing repetition to create primitively nightmarish soundscapes that were ideal for Alan Vega's stories of paranoia, self-destruction, alienation, and suicide. "Harlem II" and "All Night Long" (especially the bonus track version) present them at their most confrontationally abrasive, Vega's whoops, shouts and yelps clearly creating a disconcerting atmosphere for the hapless audience. Other tracks like "Dreams", "Johnny Dance", or "Love You" give an excellent lo-fi impression of the pop sensibility (Rev even plays a few brief catchy melodies) more frequently hidden beneath the screams and difficult minimalism of the music, that briefly reared its pretty head on songs like "Cheree" on their first album, and moreso on their far-more-polished, Ric Ocasek-produced second album. This being a low-budget live (and home "studio") recording from the 70's (ranging from 1974 to 1979 - all before their second album), the sound quality is not exactly up to 90's professional standards (or even the aforementioned mr. Ocasek's). As always with documents of this degree of historic importance, the fidelity issue takes a back seat to other considerations, and if that's much of a concern to you, you'll probably hate the music contained herein, anyway! For more information you can visit the ROIR web site. Contact via snail mail c/o ROIR; 611 Broadway; Suite 411; New York City, NY 10012.